Are you hungry now? Baby Lady calls this dish “decadent” but she’s a woman. 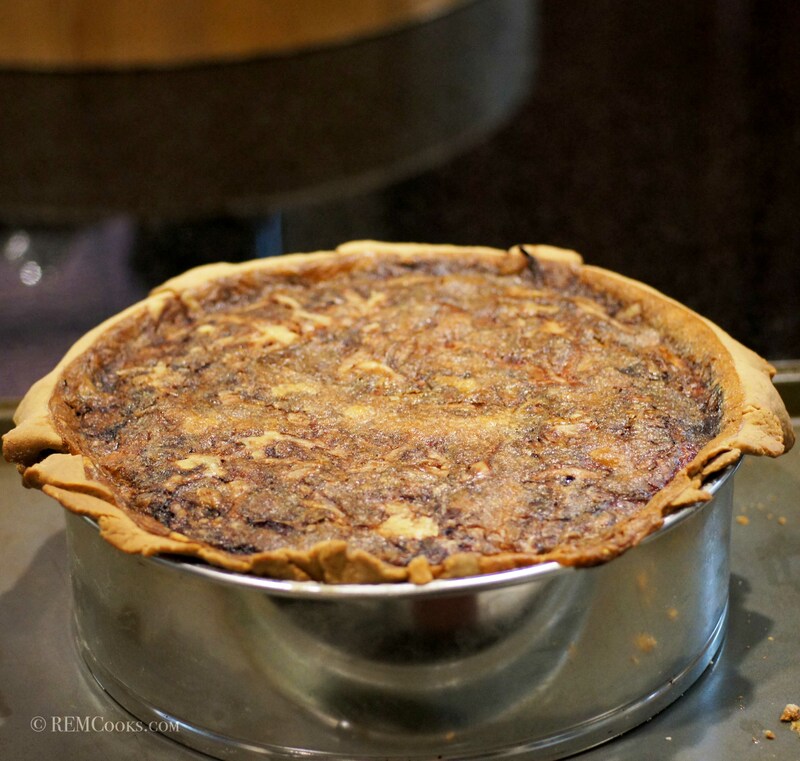 We all realize, “real men don’t eat quiche,” right? That’s because those “real men” have never eaten Thomas Keller’s Insanely Delicious Quiche Lorraine. If they had, they would have gone back for seconds! It’s so rich that thirds are completely out of the question. I could only eat the meal. This is one of the best quiche loraine I have ever eaten (maybe I’m not a real man but you would have to ask Baby Lady that 😮 ) and it better have been because there is a whole lot of work that goes into this dish. It’s also very rich and filling. 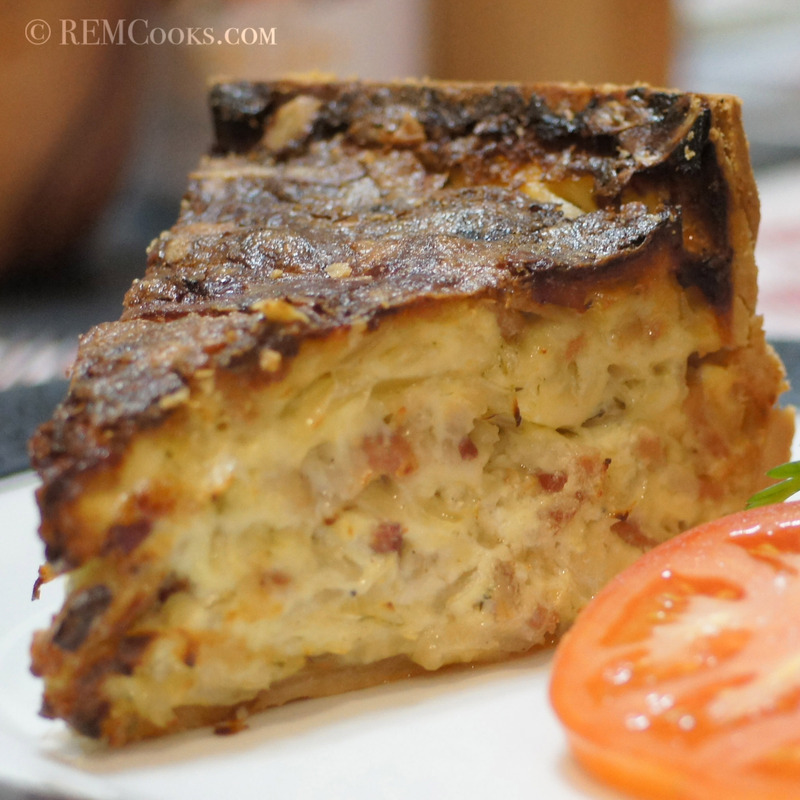 If you have the time, inclination and love quiche lorraine, then this dish is for you. It tastes as good as it looks and really is to die for. Given the amount of butter, cream and bacon in this dish, you may die after you eat it. It definitely is not on the American Heart Association’s list of heart healthy food but you gotta die from something, right? It might as well be as good as this. This recipe, however, is not for novices unless they are extraordinarily talented. For those of you with a little skill and some daring, you, too, can make this recipe. Just don’t plan on doing it all in one day! On a scale of 1 – 5 for level of difficulty, this one is a 5 and is up there with some of the recipes I learned and cooked from the Escoffier Cookbook (if you haven’t figured it out yet, this is going to be a really long post). It is incredibly good but I’m not certain I would make this again. I clearly will not make it again any time soon. It took one day to make the onion confit and pastry dough (the dough must rest overnight). 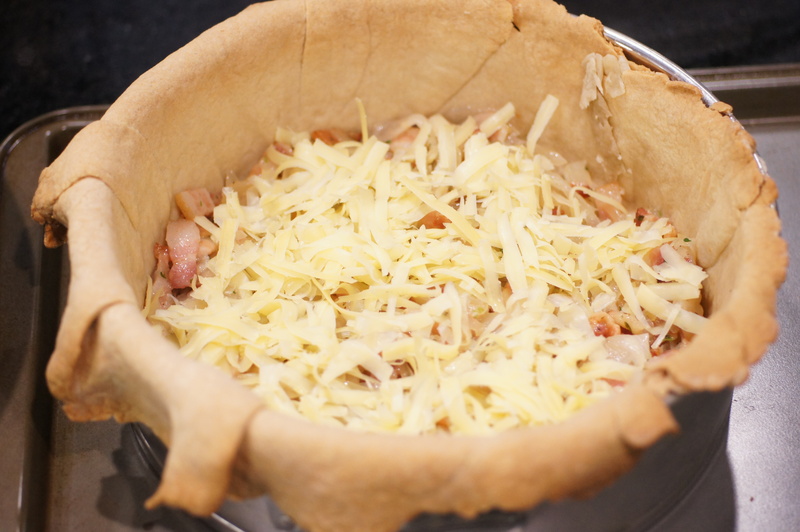 It took another day to bake the pastry shell, let it cool, make the lardon and mix with the onion confit, make the batter, bake the quiche and chill it (it has to chill for a day). So, you won’t eat it until the third day. This means if you start on a Saturday, you can eat it Monday night! Holy, moly! 😮 But it sure is good. I’m sure you are asking why in the world would I want to cook this dish? 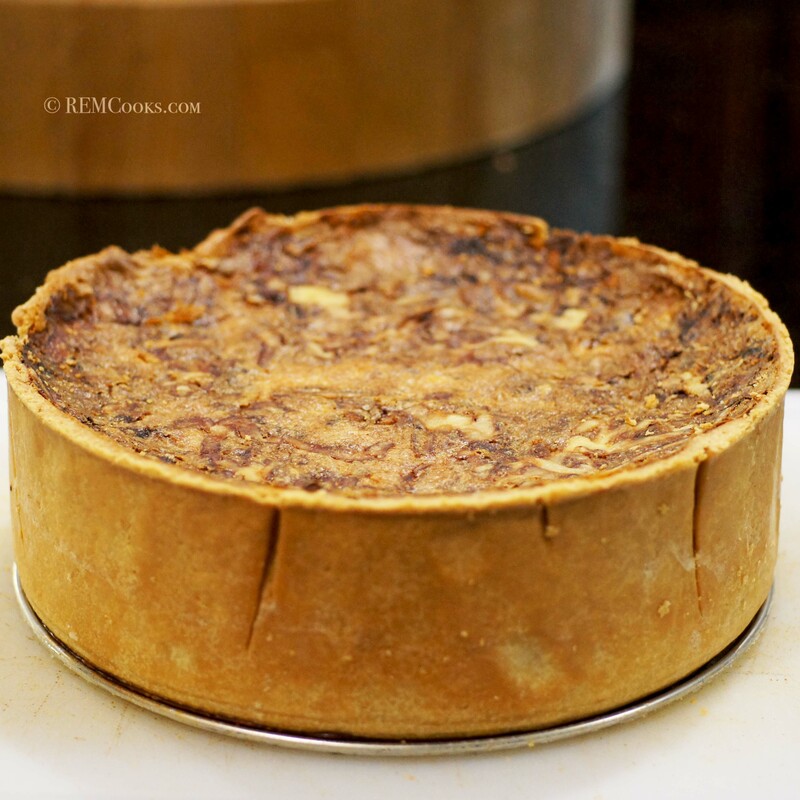 Don’t you have another, simpler quiche lorraine in your repertoire? I mean, it’s egg custard, right? Well, I do and it’s damn good but for my 58th birthday Baby Lady gave me 2 cookbooks, The French Laundry and Bouchon. These cookbooks have the recipes that Thomas Keller uses at his critically acclaimed restaurants, i.e. The French Laundry in Napa, California and Bouchon in the Venezia tower of The Venetian in Las Vegas. I have always wanted to eat at these restaurants but have never been to either of them because it is so ridiculously difficult to get a reservation. So these books are the closest I can get for the time being. Because Baby Lady gave me these books, I obviously was obligated to read them and cook something from them. Consequently, one afternoon I immersed myself into Bouchon. Now a bouchon is a type of restaurant found in Lyon, France, that serves traditional Lyonnaise cuisine, such as sausages, duck pâté or roast pork. Compared to other forms of French cooking, such as nouvelle cuisine, Lyonnaise cuisine is quite rich and oriented around meat. It’s what most people think of when someone speaks of French food, i.e. boef bourguignonne, poularde a l’Estargon, escargot a la bourguignonne, quiche lorraine, etc. According to Thomas Keller this is his favorite type of food to eat. Bouchon details various of these classic dishes and their importance while pointing out critical kitchen technique that elevates normal, ordinary dishes to the realm of royal dining. It really is quite a read and once I began I understood this was no ordinary cookbook. It’s at times like these that I miss professional cooking 😦 but not enough to do it again. 😉 Like Under Pressure and The French Laundry, Bouchon is really geared toward experienced chefs and commercial kitchens. In fact, he explains how he does whatever he does at his restaurants. Essentially, it’s a continuing education course in the field of professional culinary arts. This makes it difficult for the home cook because of 1) the time involved; 2) the necessary kitchen tools; 3) the storage space; and 4) availability of product. Nonetheless, it is a wonderful learning vehicle and with a little advance planning and a sincere desire, nothing in Bouchon is beyond the scope of a good cook, professional or otherwise. So with both eyes wide open I took the plunge on one of his simpler dishes. Have I scared you off yet? Are you ready to work? 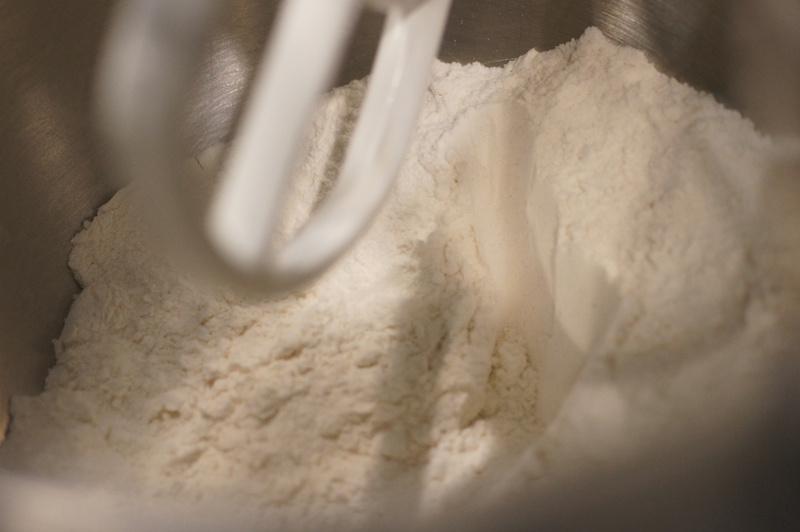 Place 1 cup of flour and the salt in a heavy duty mixer with the paddle attachment. 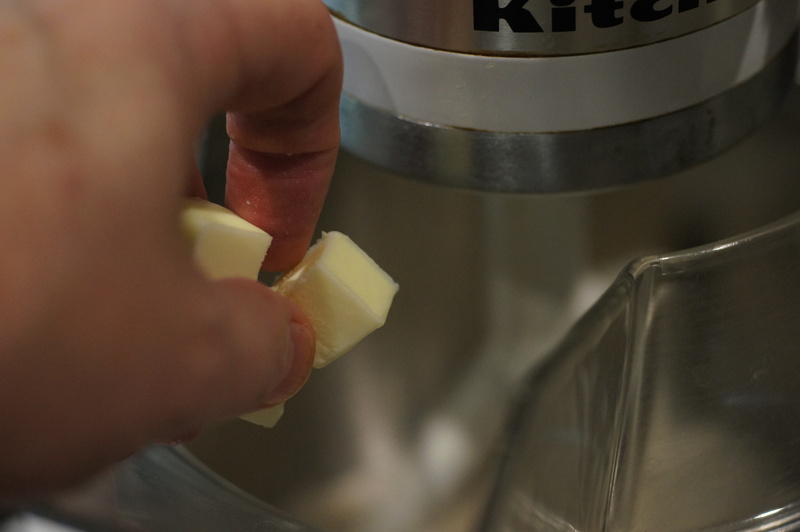 Turn mixer on low and add butter 1 small handful at a time. 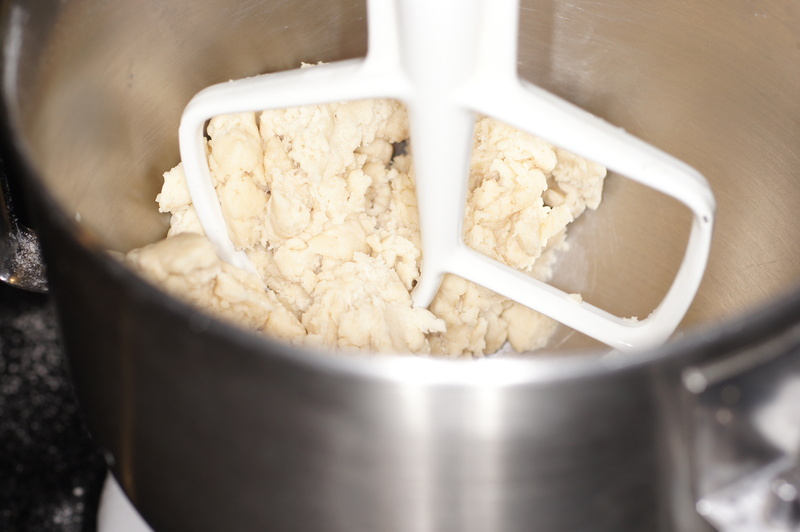 Once the butter is completely added, turn mixer to medium and mix until butter is completely mixed with the flour. 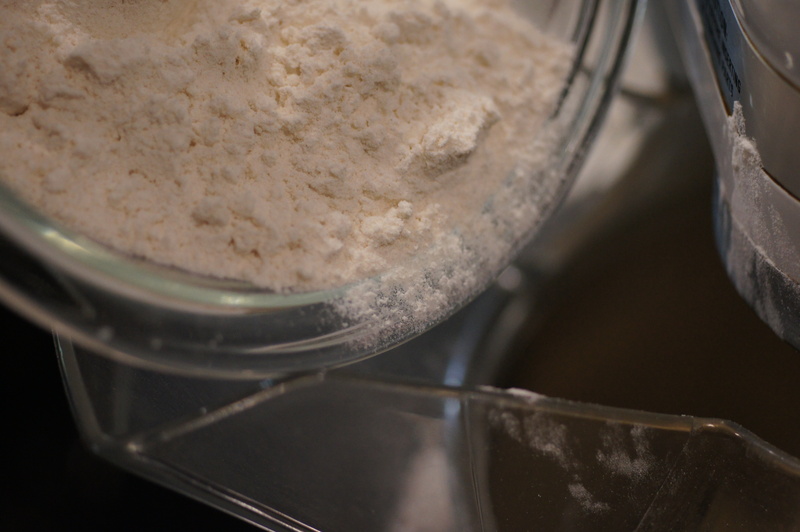 Now, reduce speed, add the remaining cup of flour to the bowl and mix to combine. Next, add the water, and mix to completely incorporate. The dough should come around the paddle and feel smooth to the touch, not sticky. Remove the dough from the bowl and mold into 6 inch round. Cover with plastic wrap and refrigerate for 1 day. 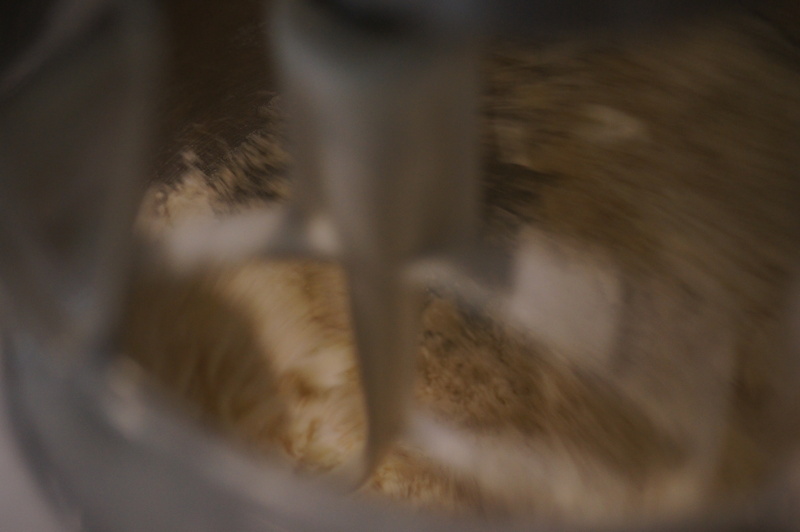 The purpose for such a long refrigeration time is to allow the dough to rest. The longer the dough rests, the less shrinkage there will be when you bake the shell. 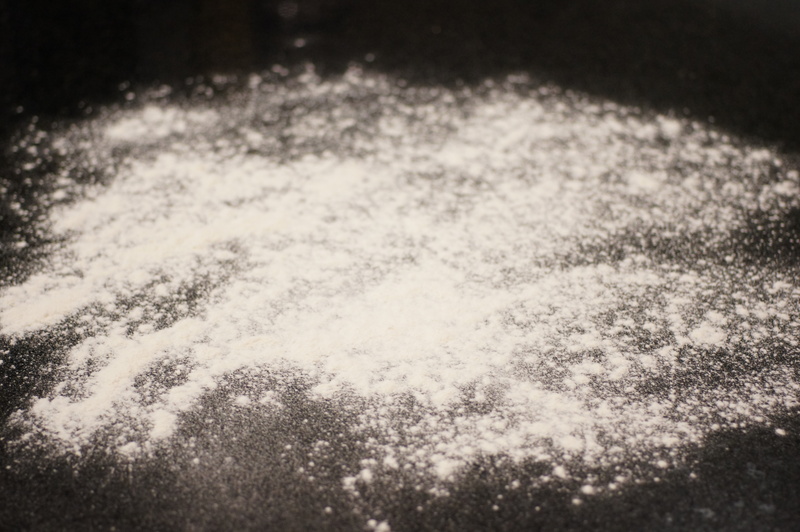 After allowing the dough to rest, lightly flour a surface. 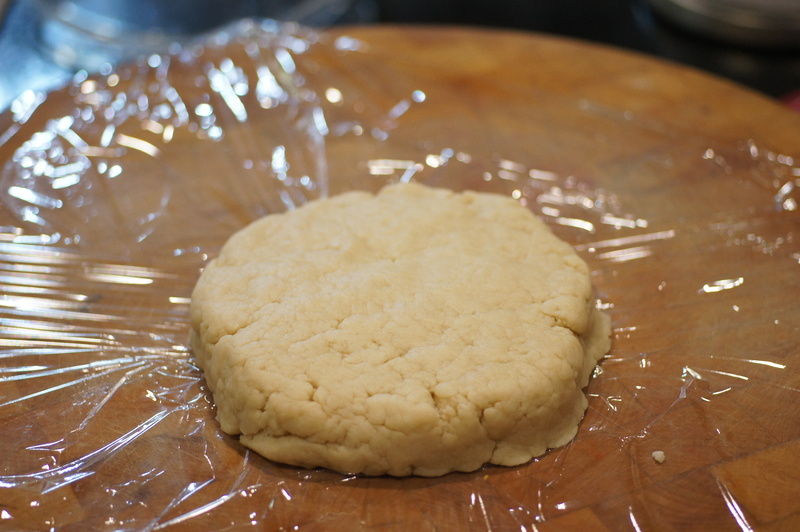 Roll out the dough until it is roughly 3/16 inch thick. Transfer the dough to a lightly oiled 9 inch spring form pan and mold dough to fit pan pressing gently around the sides and the edges of the pan leaving the excess to drape over the top to help prevent shrinkage when baking. 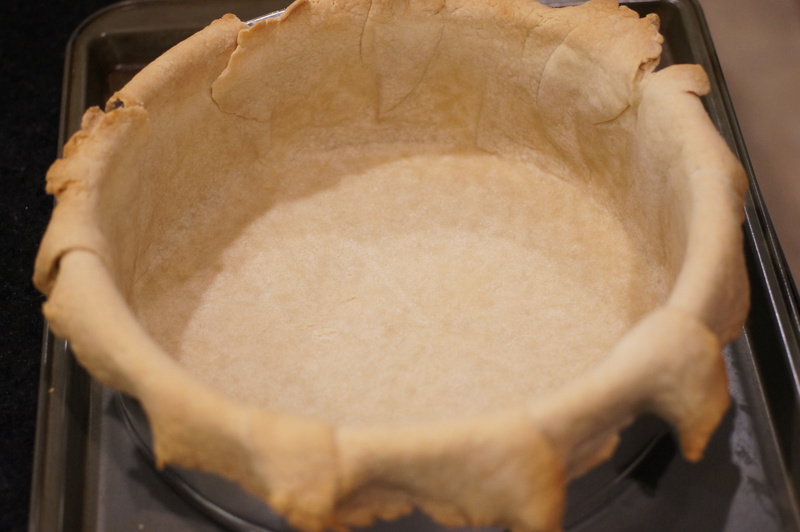 Preheat oven to 375 F. Cut a 14 inch parchment round and line pastry shell with parchment round. Fill pastry shell with beans. Do you have any idea how many pounds of beans it takes to fill this spring form pan??? 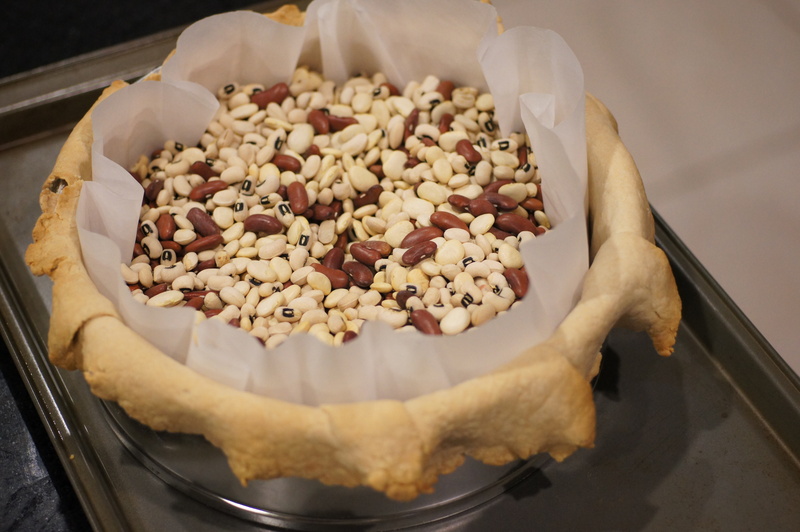 Obviously, I didn’t when I started this project because it took all of the beans I had in the pantry. 😮 Try 5 pounds of beans!! 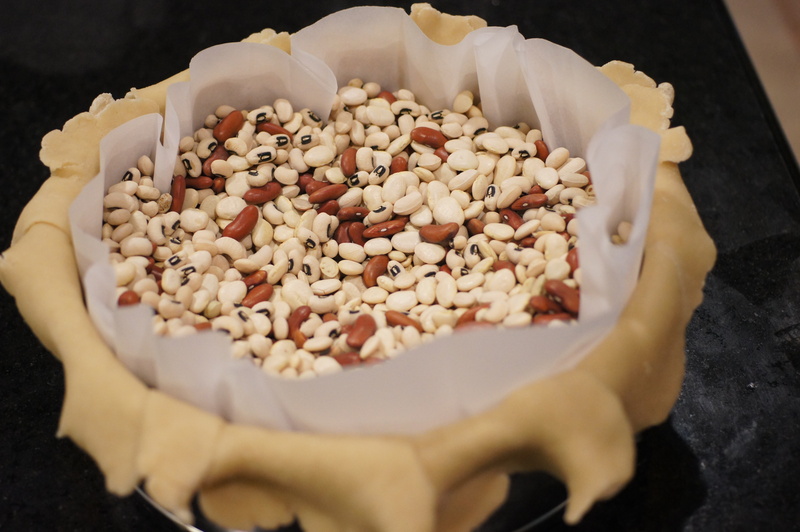 Place the pastry shell in the oven and bake for 35 – 45 minutes until the sides are brown but the bottom is still light in color. Of course, you won’t know the color of the bottom unless you remove the parchment paper and beans. So, remove from oven, carefully remove the parchment and beans. Return to oven for another 15 – 20 minutes or until the bottom is a rich, golden brown. Remove from oven and allow to cool. While the pastry shell is cooling, bake the lardons in a 375 F oven. 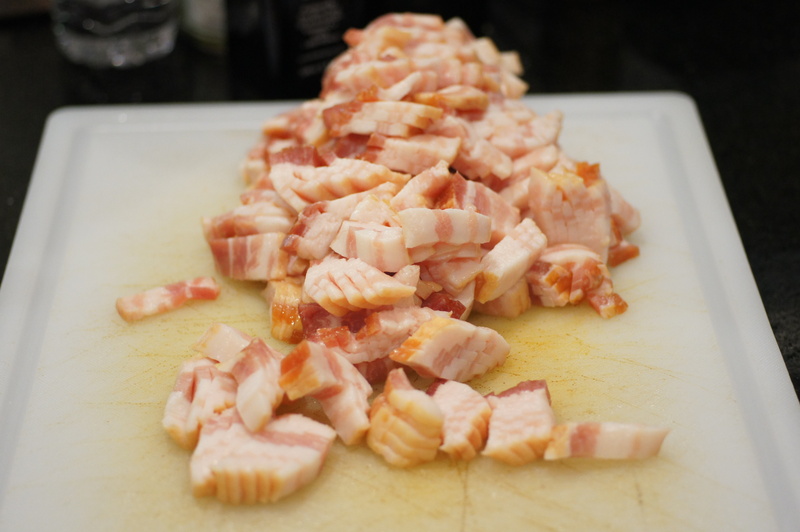 You want to bake the lardons long enough to render the fat, not until it is crispy. When done, remove the lardons to a paper towel to drain. 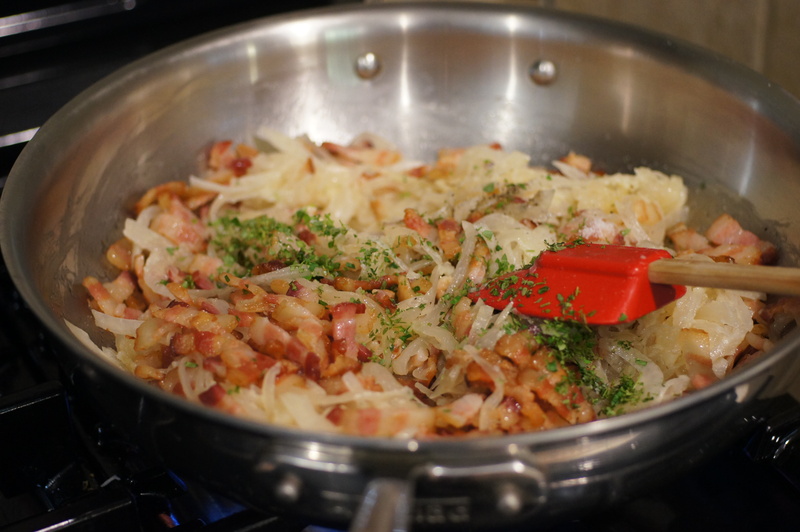 Next, add the lardons, thyme, onion confit, salt and pepper to a large skillet and cook until warmed throughout. While the pastry shell is cooling and the lardons are cooking, make the batter. Combine the cream and milk in a sauce pot and scald over medium heat. Let cool for 15 minutes. 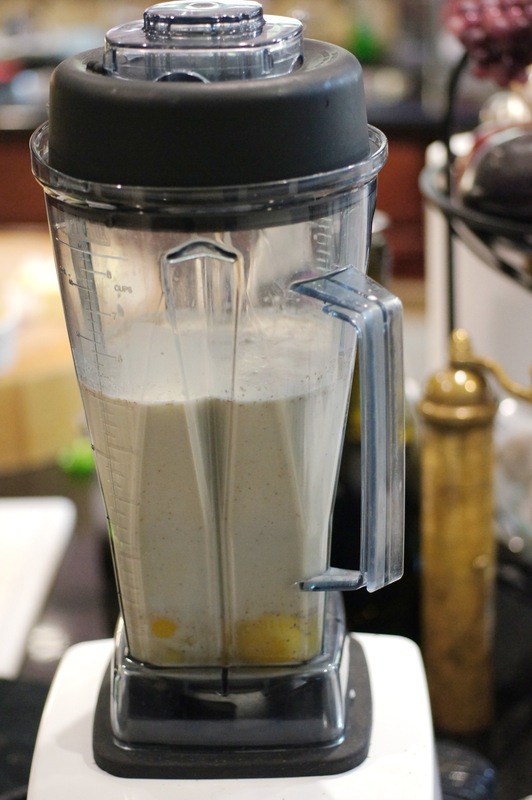 Add the eggs, cream mixture, nutmeg, salt and pepper in a blender. If you don’t have a large blender, prepare the batter in 2 batches, one for the first layer and the second batch for the second layer of the quiche. 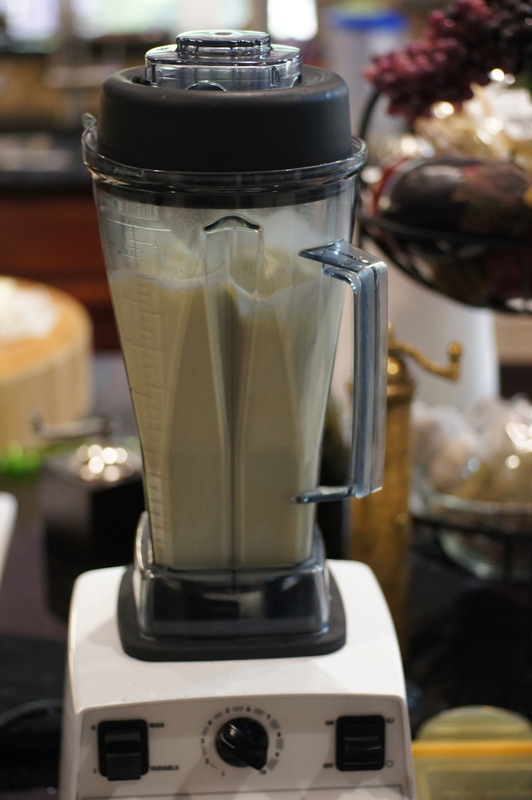 Start blending at a low speed for 5 seconds and increase to high speed for 30 – 60 seconds. You want a very frothy, light batter. Set aside until ready to use. If it sits for over 5 minutes, re-blend for a few seconds. 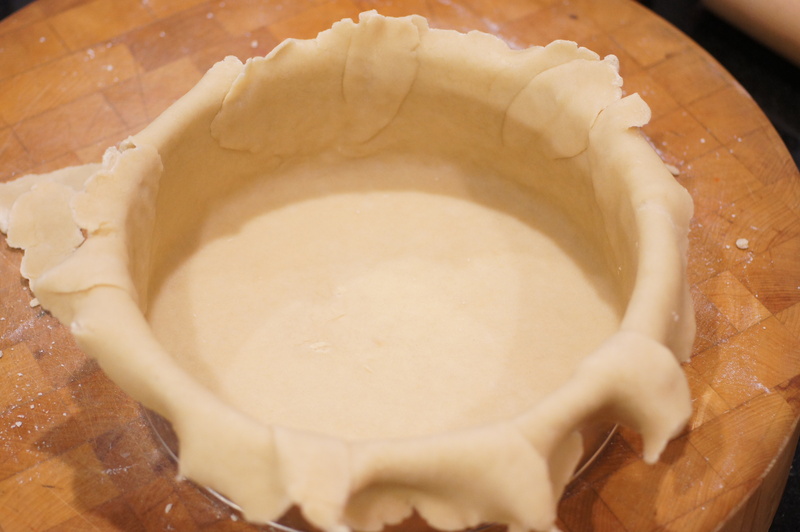 Take 1/2 of the filling and place in the bottom of the pastry shell, covering the shell evenly. Put 1/2 of the grated comte cheese on top. Now, pour 1/2 of the batter over the filling. Take quiche to the oven, place on a rack and pour the remaining batter into the center of the quiche to fill the shell to the top. 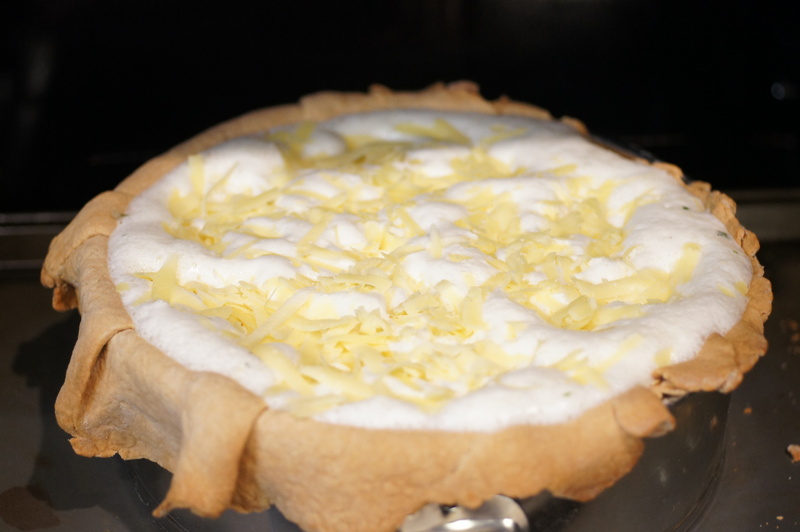 Bake at 325 F for 1-1/2 to 1-3/4 hours until the top is nicely browned and the custard is set when when the pan jiggled. Remove from oven and allow to cool. 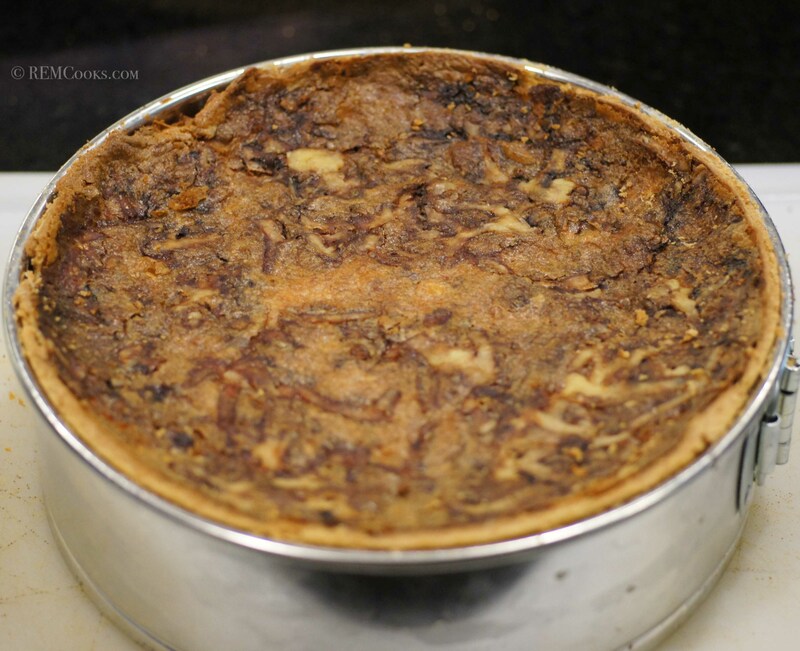 When cooled, place quiche in the refrigerator for 1 to 3 days. Actually, there was no way I was going to wait for 3 days. 1 day was long enough. After 1 day, trim crust away from pan. 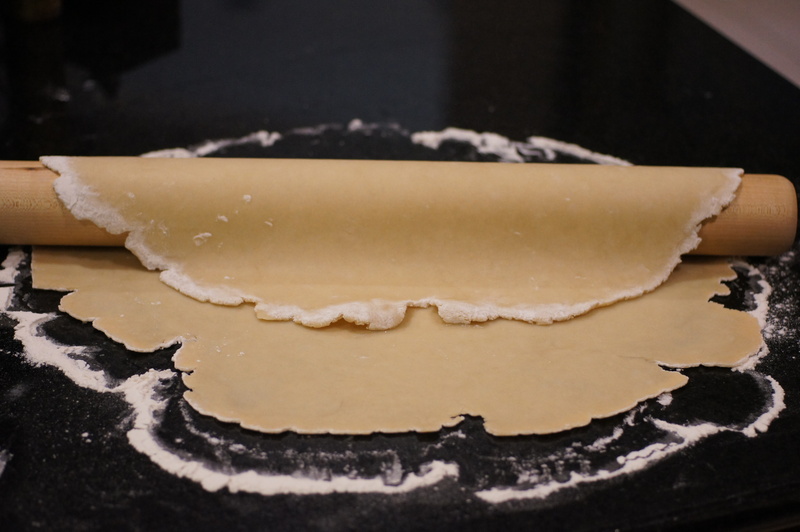 Insert a knife and slide around rim of pan to ensure the pastry shell does not stick. Remove from spring form pan. Slice into 8 slices (Thomas Keller says 6 but that is a lot of quiche). Place slices on a lightly oiled baking sheet and bake at 375 F for 15 minutes or until warmed through. To check, insert a skewer in the middle of one side and slide it to the back. Rub the skewer on the skin immediately underneath your lower lip. Serve with a light salad or sliced tomatoes and enjoy. Hi, Andreea. Thanks for your nice comment. 🙂 This is a killer quiche if you have the time to make it. 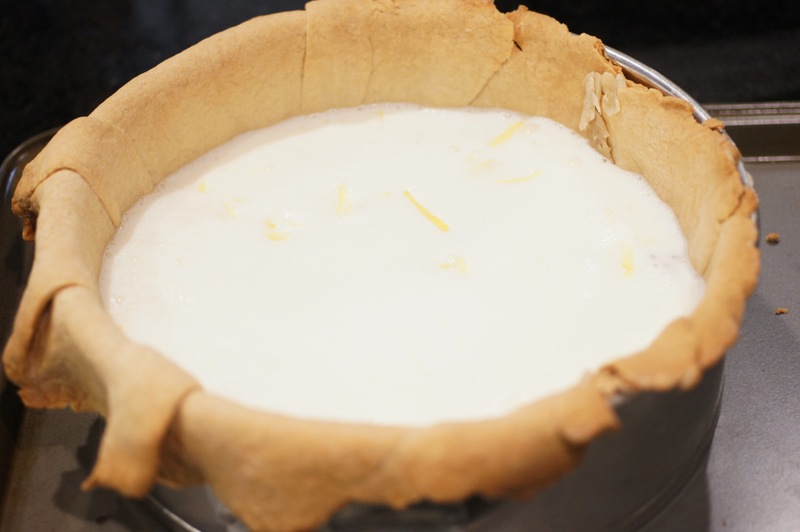 The batter is a basic batter for any quiche, and the pastry shell is also a basic shell. So, you can mix and match any ingredients you choose in the quiche. If you don’t use the onion confit and only allow a couple hours for the pastry dough to rest, you can shorten the time by 1 day. I had never let a quiche rest for a day prior to serving but it makes a huge difference on a quiche this deep. We had it again for lunch yesterday and the extra day resting made it even better. I was very surprised. Whoa, this is simply amazing! Thx for sharing. I’ve made a slightly simplified version on a Sunday afternoon and waited two days to eat it — it was outstanding! Post to follow soon. There are two steps that I skipped because I didn’t see the point, perhaps you can enlighten me? Why scald the milk and cream? 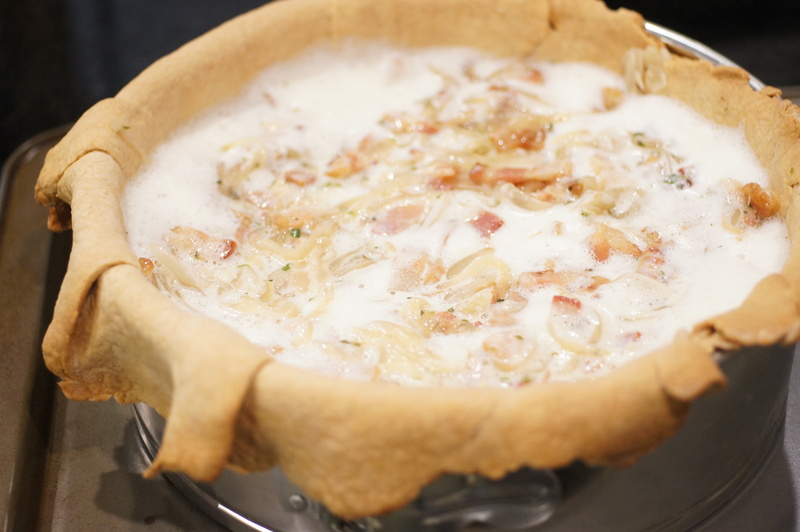 Why heat up the lardons and onions before adding to the quiche? Actually, I agree on the scalding the milk and cream the way he does it. I could see doing it if he didn’t let it cool for 15 minutes because scalding the milk can help cut down on cooking time through jump starting the cooking process. Nonetheless, he is much more knowledgable than I so I did it anyway. Heating the lardons and onions should help in even cooking of the custard. According to Wikipedia, it’s quiche vosgienne with cheese and quiche alsacienne with onions. I never like recipes with complicated steps without an explanation of why doing it. The even cooking makes sense. I didn’t know refrigerating the crust would help prevent shrinkage, thanks for the tip! I’ve had terrific quiche in 2 restaurants, one of which we are able to frequent for Sunday brunches. I’ll keep this recipe to make when we have guests, it’s a lot for two people…unless it can be frozen…can it? Deepest quiche i’ve ever seen – looks delicious! And I know writing long posts make you feel like you’re at work! This quiche looks incredible, Richard, and I applaud you for making it and sharing the process. Apparently Quiche Lorraine, much like Rome, wasn’t built in a day. But to wait 3 days? Like you, I doubt that I could. My curiosity would get the better of me, to be sure. This is hardly a dish I would make solely for myself but I will keep the recipe on file. It’s definitely a dish for guests. Thanks for sharing. Hi, John. Thanks. 🙂 Sorry to take so long to respond to your post. Somehow, I missed it. This is definitely a quiche to make for dinner guests. One slice is very filling, indeed. So much cream and bacon! But, I love quiche lorraine. I bet this was fantastic! Thanks for your nice compliment. 🙂 It was absolutely the best quiche loraine I have ever eaten. You should give this a try. It was better after the second day. The word magnificent springs to mind. There’s so much thought and planning in what a chef might do (besides a home cook would) and the technique, the layers, the resting and final cut of that quiche demonstrate all of this. It looks meaty, intense and so darn delicious! I’ve actually been making quiches in the new pastry module at school so might not get around to this just yet, but certainly loving the look of Mr Keller’s version! Actually I remember that sometime last year (you also had a boil & bake method for a crust.) we’re currently in the butchery module at school and I know we’re doing boil & bake pastry in a couple of weeks for game pies. I’m looking forward to trying this new technique! Vita Prep, vacuum sealer, giant salt rock, MAN AM I JEALOUS!! Feel free to make any donations to the poor Southern girl living in Buenos Airs. That quiche is GORGEOUS. And I want to start playing with sous vide. Is a vacuum sealer an ABSOLUTE MUST or can I get around it using super human strength and high quality ziploc bags? Hi Liza. Glad you like the toys and thanks for the very nice compliment. I’m very lucky to have a very understanding and tolerant wife who puts up with my toy purchases. She even put up with me buying a 12″ commercial deli slicer so I could make sandwiches for the kids. As for the sous vide, I have seen people who have used the technique of slow cooking at low temperatures in high quality ziplock bags. I have never tried it. I started with a food saver vacuum sealer and it will do the trick for most purposes. If, however, you are going to do any cooking with liquids, i.e. poaching in olive oil or braising liquids, then a food savor vacuum sealer begins to show its limitations. It can still be done and there is a lot of info on the internet on how to do it. Nonetheless, that is when I opted for the chamber vac. It also allowed me to do compressed vegetables and fruits, not to mention store leftovers more conveniently, flat bags take up a lot less freezer space than mason jars. Stefan, at Stefan’s Gourmet Blog, http://stefangourmet.com, is much more adept at sous vide than I. He is using a front end vacuum sealer and probably could help you on superhuman strength and high quality ziplock bags as a substitute for a vacuum sealer. Check him out. You rock, Richard. Thanks for taking the time! Check out the videos on how to sous vide without a vacuum sealer. You just lower the zip-loc filled with your food into a tub of water and the water pushes the air out of the bag. This looks amazing… thanks for sharing! Thanks for the nice compliment. It is incredibly delicious. How have I never noticed this post before now??!!! That quiche looks incredible! Dan, another real man who eats quiche, made one last week and it was the first time in years we’d even thought about it. T’was divine but maybe next we’ll take the Thomas Keller path and see what we can muster. Yum. Hi, H-J. Thanks for the nice compliment. I have no idea how you missed this post but glad you finally found it. 🙂 This is a whole lot of work and makes a HUGE quiche but it really is worth the effort. It also refrigerates well and keeps for about 5 days after you slice it. I have a different quiche plate one that is wider and shallower so I had to change the batter quantity. In general this recipe comes out very tasty and worth the time to make it and wait. I now make it once a week with slight variations. Excellent post and thanks for posting it and adding the helpful explanations and images. The worst is when the crust leaks. After baking the crust and you find a crack or a hole in the crust make some mortar to fill it. Take some of the crust and mash it with some of the custard it makes a perfect mortar at filling in cracks in the crust. I have made this quiche several times and it always turns out heavenly. The Onion confit is so rich I find the bacon to be over powering and leave it out of the filling. Serve the quiche with some smoked salmon, or Serrano ham to compliment it. Thanks for the very nice compliment. We’re glad you liked it. The addition of asparagus sounds wonderful. As for the mess, did you use a 9″ spring form pan???? I had no problem with mine. It filled to the level shown in the photos with no overspill. Perhaps it was taller. I don’t care if this is a quiche or tart or whatever – it looks fabulous! I thought scalding milk was left over from the days when it wasn’t pasteurized, but maybe you’re right and helps with cooking. I’ve got a Charlie Trotter cookbook that I’ve never touched, because evverything is so ridiculously complicated. But his food was complicated. I don’t like it when I feel that chefs are pimping people around by making recipes more complicated. I’m with Stefan on that one. Happy Birthday by the way. My next one, this week, is 59! yikes!!! I have made this recipe several times because it is THAT good and so worth the effort. Richard you are right, the first time you make this it is a lot of work and you can spend hours on one component. Now that I am more confident in making the crust I notice that I have gotten faster. When I made this on Friday, it took all day to get it made and in the refrigerator to take to my sister on Saturday. 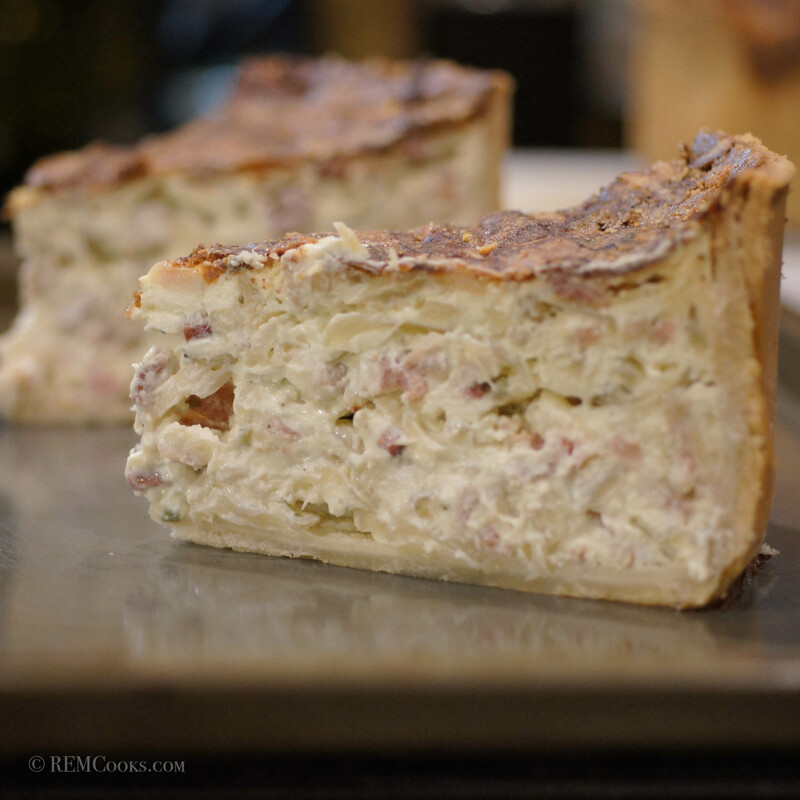 Have you tried any of the other quiche recipes in Bouchon. The leek one sounds amazing also.